Do the seeds bother you? I added some to our smoothies last week and I couldn't get over the seeds. I choked them down since they were good for me, but it wasn't awesome! oh I could not wait to start working out and eating again! This looks good! I love spinach!! This sounds awesome & I bet it is completely amazing for you. Thanks Linds, you will be back to your pre-pregnancy body before you know it! Nicole- chia seeds are my favorite...so no they did not bother me at all. Plus, once they come in contact with any kind of liquid they start to become gelatin like and make the smoothie that much better. Sounds delicious! Whole Foods carries a drink with Chia Seeds in it...doesn't bother me at all, while hubby and youngest think they are gross! LOL They don't like the texture. I agree, very similar to gelatin. This looks and sounds great! I love coconut milk and already have a big bag of chia seeds that I use in my overnight oatmeal, so this sounds like another great way to use them! Thanks for the recipe! I love how spinach is so unnoticeable in a juice/smoothie. I'm sure you will return to your pre-preg body very quickly!! Congrats again on the new family member! I have been wanting to try chia seeds but have not made the leap. What are the benefits? YUM, this looks so tasty. Love the babe onesie you put on Insta, soo cute. this sounds good- I've been hearing so much about chia seeds I've resolved to go on the hunt for them tomorrow! I love everything in this smoothie! Designer Whey is the best - it dissolves so easily! I've said it before on instagram/twitter, but really - can't thank you enough for introducing me to chia seeds. Love those tiny things! Looks yummy - that's definitely a better way to drink Chia seeds than how we've been doing it (water, honey and lemon juice). I will pass your recipe along to my hubby, I'm sure he'll enjoy it! That looks good. Also your baby is so so cute. Congratulations. I keep hearing about the chia seeds but I haven't tried them yet. I like that they help make you feel full. Sipping mine right now! 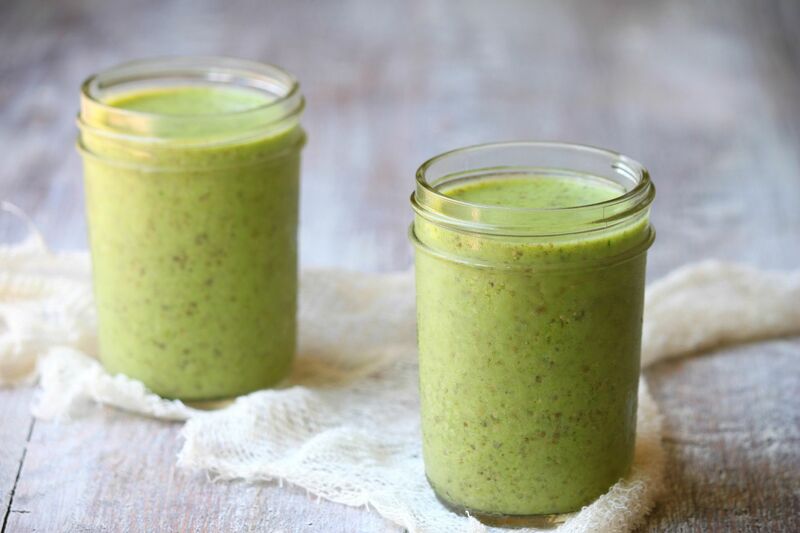 I do the green monster every morning, thanks for the new recipe! I keep trying to convince myself to try chia seeds but I don't care for texture (pulp, etc) in drinks. I guess you never know till you try, huh? Just found your blog a few days ago, and I'm hooked! I've already tried a couple of your recipes and love them so far. Today, after my 40 minute workout, I tried this one (chia spinach smoothie) and wow... I think I love coconut milk now! It's really great!! Thank you so very much! Is this a recipe for two smoothies? It shows it in the photos and I did a quick calorie check on the recipe and it is about 400 calories with light coconut milk. Or does this make one? Great recipe! Where do you get your seeds? I've used http://eatseed.com and they seem the fastest and cheapest. Time to make a smoothie Thanks! Before I had finished drinking my smoothie (I had drunk about half) I began experiencing very bad stomach pains, this was followed by nausea and loose bowel movements. The coconut milk that I used was canned and the only ingredients listed on the can are: coconut extract (75%) & water. I assume the can probably has BPA but would that cause such a severe and sudden reaction? I am not accustomed to drinking coconut milk but did introduce coconut oil (organic, cold pressed, extra virgin) in to my diet a while ago with no adverse effects. I do not suffer from IBS or other digestive issues, as far as I am aware. Do you have any idea as to what the issue may be? Does my body need to get used to the coconut milk or high fat consumption? Would switching to almond milk help? I hope I don't have to cut coconut milk from my intended diet plan completely. I have made a batch of chai pudding using coconut milk but I am a bit afraid to eat it due to how awful I felt after the smoothie.